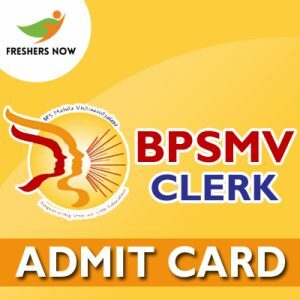 BPSMV Clerk Admit Card 2019: The candidates who were in search of where to get the BPSMV Clerk Hall Ticket 2019 can refer to this post. Because we gave complete details in order to help the Participants. As per the Notice, the higher authorities of the Bhagat Phool Singh Mahila Vishwavidyalaya (BPSMV), Haryana are going to release the bpswomenuniversity.ac.in Non-Teaching Staff Admit Card 2019 in the month of February 2019. Also, they announced that the BPSMV Clerk Exam Date will be tentatively in the month of March 2019. So, the candidates should be well prepared to take the BPSMV Non-Teaching Staff Exam. Moreover, the BPSMV Clerk Selection Process is carried out in 2 rounds, the details of that are mentioned in the below sections. You can also, refer this information to get a clear idea and also direct download links to download the admit card is available on our post. The Higher authorities of the Bhagat Phool Singh Mahila Vishwavidyalaya (BPSMV), Haryana decided to conduct the Exam in the month of March 2019. So, they declared the BPSMV Clerk Exam Date 2019. Because this year, lot many applicants are waiting to take the Written Test and get placed across India in the Clerk, Steno, Driver, Lab Attendant, Assistant & Other posts. Soon after knowing the Exam date, candidates need to wait for the BPSMV Clerk Hall Ticket 2019. Hence, we suggest the candidates refer to the below sections to know the Selection Process. As per the Recent Notification, the BPSMV Clerk Selection Process 2019 includes 2 rounds. They are the Written Test followed by the Personal Interview. Make a note that the written test will be multiple choice objective type with a duration of 2 hrs. After attempting the test, the hopefuls need to wait for the Result and then, the qualified candidates will be promoted for the Further Round of the Selection Process i.e. Personal Interview. In that round, the document verification is also done. Make sure that you keep all the essential documents with you safely. Make a note that any Identity proof you carry along with the bpswomenuniversity.ac.in Non-Teaching Staff Admit Card 2019 for the Written Test should have their latest photograph on it. Candidate can carry anyone from the below given List. First, go to the www.bpswomenuniversity.ac.in, the Official website of Bhagat Phool Singh Mahila Vishwavidyalaya. Next, Go to the Current News column on the right side of the home page. Then, search for the desired BPSMV Clerk Hall Ticket 2019 link from the live links scrolling on the Homepage. Click on it and you will find some login credentials to get the bpswomenuniversity.ac.in Non-Teaching Staff Admit Card 2019. Fill the fields such as Registration number, and password. Finally, BPSMV Clerk Admit Card 2019 displays on the screen. Thus, by referring to this post, we think that you got a clear idea of the BPSMV Clerk Admit Card 2019. For more such similar details, keep in contact with our website Freshers Now and visit regularly for Latest News. Also, you can bookmark for push notifications and updates. Moreover, leave a comment in the below section for any doubts and questions.